In a region where a lot of people pride themselves on having their fries and coleslaw ON their sandwiches, you can expect other quirky tastes. Here are a few you might want to try. Or not. At this landmark pizza place on Banksville Road just south of the Fort Pitt Tunnels, the toppings, including the cheese, go on AFTER the pizza comes out of the oven. Hot pizza crust and sauce, mostly cold toppings. People love it or hate it. But enough people love it that the family-owned place has been open since the 1950s (it started in Oakland) and was just a few years ago renovated and expanded. Try a square for $1.40 plus 55 cents per topping. They say most people fill up with two cuts. Kombucha is fermented tea made with a “glob” of bacteria and yeast. It’s been around for centuries. This local version of the resulting sour, bubbly beverage has alcohol in it — about 2.5 percent — and so it is sold in Pennsylvania as beer. If you’re 21 or older, you could visit Red Star’s “Buch” Bar in the Pittsburgh Public Market in the Strip District and order a pint, or a growler or bottles to go, in flavors ranging from green tea and ginger-hibiscus to “super tart” cherry and oak mulberry. Red Star just opened a Buch Bar in Philadelphia’s Fishtown neighborhood and may start up a kombucha truck. Pittsburgh’s Mad Mex restaurants started this fall tradition of taking all the fixin’s of Thanksgiving dinner — turkey, gravy, potatoes, stuffing and corn — and rolling them up into a burrito. At least they put the cranberry sauce on the side. Wash it down with a pumpkin beer. One of the wurst holdovers from the German immigrants who built Pittsburgh’s North Side when it was its own city of Allegheny, this strong-tasting smoked pork liver sausage still has a lot of loyal fans. Two regional brands are Silver Star and Alberts. You can try an open-faced Bavarian Club sandwich at Max’s Allegheny Tavern on the North Side (if you can figure out how to get your hands and lips around it). 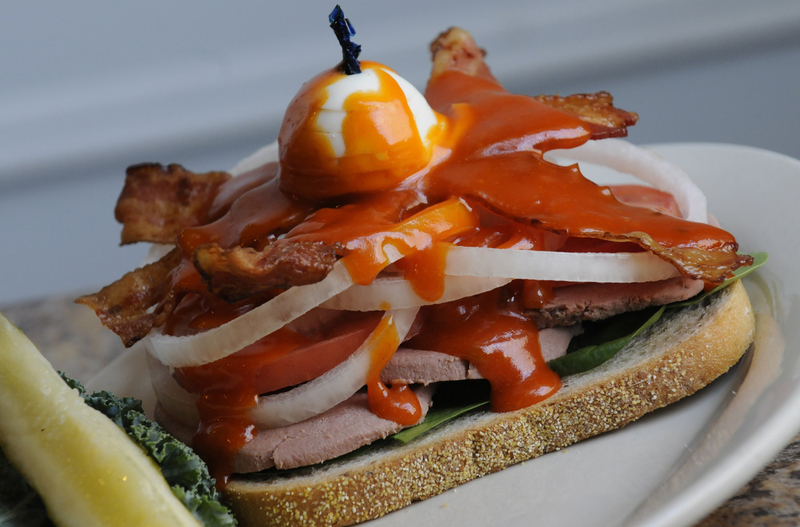 It’s gussied up with bacon, tomato, sweet onion, spinach, hard-cooked egg and secret sauce on rye. But the classic way to eat braunschweiger is between two slices of white bread slathered with mayo or Heinz ketchup.